There's a saying in the Doctor Who fandom that, "You never forget your first Doctor." And, in my experience at least, that's true. Mine was Tom Baker. I watched reruns of his tenure on PBS with my dad when I was a little girl. So, even though I didn't become a real, diehard fan until the reboot, I still hold a special place in my heart for Baker and his scarf-wearing, Jelly-Baby-eating antics. It's kind of the same thing with Picard. I very clearly remember watching the first seasons of TNG when I was a kid. Even though, at the time, I was really young, I have very clear memories of seeing those episodes when they were new. And, because of that, I guess, I'll always have a special place in my heart for that ship, crew, and captain. I was, though, appalled and not 100% surprised to see TNG ranked so low and Voyager ranked so high. As I pointed out in my first Bechdel post, as far pure as numbers go Voyager doesn't actually have any more regular female cast members than TNG or DS9 but one obvious difference is the parts these women play. In particular, Voyager has a female captain. A lot of what I saw online when these test results were released were comments that followed this kind of logic-- "Well, of course Voyager did better. It has a female captain so it's more female centric." I mean, I guess you could say that but, what does that even mean? Instead of just stopping there, I think it's important to think about what's really going on here. I think it's a little more nuanced than that. Because, ultimately, Star Trek is about a ship, its crew, and its captain. The captain is a separate entity because everything rests on their spandex-clad shoulders. Everything in Trek goes through the captain. Every plot, every sub-plot, practically every character arc--somehow the captain ends up getting involved. I'd love to go through (on my next re-watch, I guess) and see how many scenes are shot in the captain's ready room. Anyway, if everything eventually filters through the captain, then the female crew members are likely to end up having conversations with them. When I first decided to further analyze Trekkie Feminist's results, I went back and watched the first three episodes from TNG, VOY, and DS9's Season Fives. TNG passed. DS9 failed. VOY passed. Actually, every single episode of Voyager's Season Five passed the test and it was the only Trek series to have such a season. In the episodes of Voyager that I watched, Janeway and Seven talk, Torres and Seven talk, and Janeway and Torres talk. As you scroll through the official results, Janeway's name comes up over and over. In fact, if you subtract the times an episode passes solely on the basis of Janeway speaking to another female character, you lose eleven episodes--out of a 26 episode season. This--the most successful season in Trek according to the Bechdel Test--goes from a 100% rating to about 58%. If any of the other Treks had had a female captain, I think its Bechdel score would've gone right up. And it's not because she would be having episodes about boys and periods and chocolate and whatever other clichés women are supposed to talk about. It's not because having a female captain means the ship is steered in a more girly direction. It's because eventually everyone has to talk to the boss. If Sisko has been a lady, all his deep conversations with the "old man" would've ranked. If Picard had been a Jeena instead of a Jean Luc, all his discussions with the doctor or the counselor (wherein she said, "He's hiding something, Captain.") would've ranked. But why is any of this this important anyway? Well, because stuff like Trek is aspirational. Kids watch this stuff and they pick a character that seems most like them and they say, "That's me." or "That could be me." I know I did. As a kid watching TNG, I wasn't a huge fan of either Crusher or Troi. They just weren't interesting to me. My favorites were Data, Geordi, and Picard. I loved them and, in many ways, I identified with Geordi and Data--even though they weren't girls. But then Voyager came along. At just the right time. I was in 5th grade when the show premiered and I loved Janeway. I loved Torres. I loved Seven. Re-watching the series last year, I found that I still love them. I admire their smarts and their tenacity. I admire the way they argue from opposite sides of the same goal. I love the way Janeway treats her crew like a family. 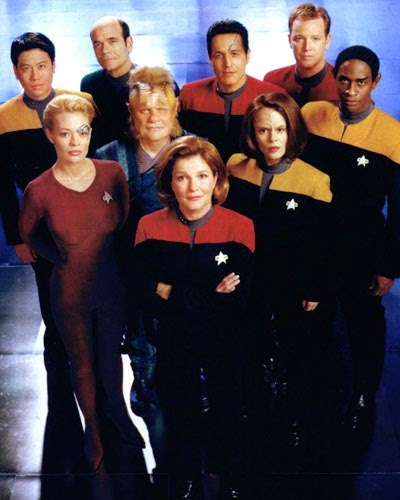 Growing up I felt like I was part of that family and I looked up to Janeway. And I think that is, at least for me, the key. I loved Picard. He was my first captain. I still love him. And, as an adult, I admire the choices he made, the way he handled himself, the way he governed his crew. But, as a kid, I didn't look up to him. I didn't aspire to be him. 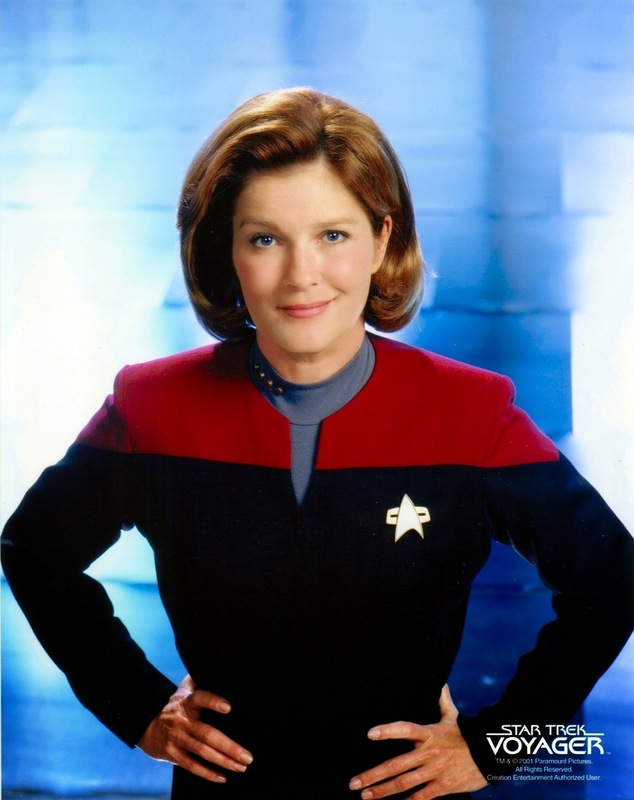 I looked at Janeway and I wanted to be like her. I wanted to be her. I wanted to be a leader. I wanted to have that same kind of agency as a woman in the real world. I wanted to be in charge of my own destiny and my own projects and then... I kinda did. I started my Shakespeare program when I was twenty years old because I thought I could. I decided to be a writer because I thought I could. I decided to watch all of Trek in a year because I thought I could. How much do those things have to do with Janeway? Did I have more confidence in myself and my abilities because I watched her be awesome for seven years? I'm really not sure. But having her as a role model absolutely didn't hurt. She was and is important to me. And, in the end, maybe that makes her my captain. Dax and Kira interacted most in "The Siege" from the second season and "Way of the Warrior" in the fourth season but were otherwise part of very different circles on the station even though they overlapped with Sisko. DS9 had strong females, but they operated in a male-heavy world. Counting Kai Winn, Kasidy Yates, and the Female Founder, women in a position of power was a general theme of the series. But no, they did not do a lot of interacting, unless you count Kira and Mirror Kira, which made a very interesting "Crossover." I'm glad you appreciated Janeway. Her bond with Seven was always a highlight for me.